A zitan brushpot of slightly flared, cylindrical form with a slightly rounded rim and wide foot with an inset plug. Inlaid in high relief on one side of the exterior in mother-of-pearl, coral, green-stained bone, malachite, lapis lazuli, turquoise and buffalo horn with prunus branches and peonies. 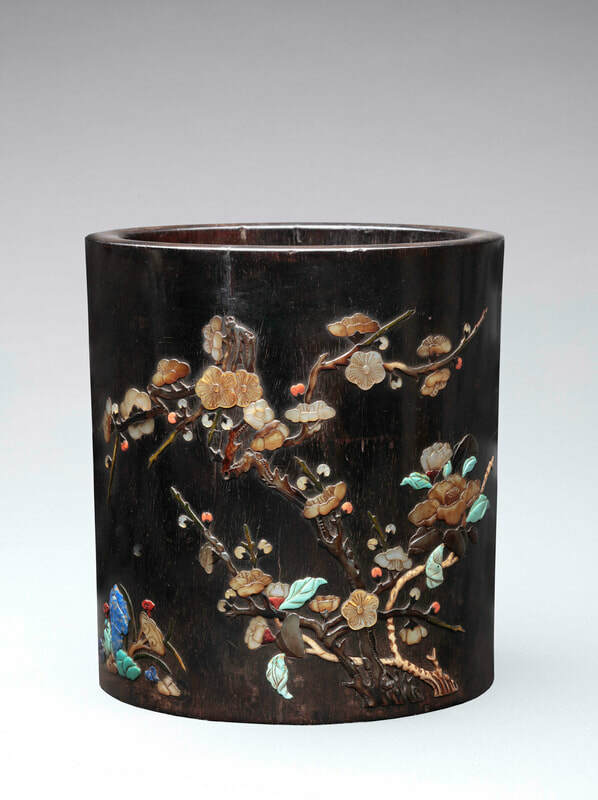 Another zitan brushpot inlaid in a similar technique acquired by the Victoria & Albert Museum in 1855 (2159-1855) is illustrated in Craig Clunas, Chinese Carving (Victoria & Albert Museum, 1996), fig. 71, page 62 with date 1750–1850. For a discussion of this type of inlay work, which was produced by the Zhou Zhu workshop (hallmark Zhouzhi) of the late Ming dynasty, see Curtis Evarts, “The Zhouzhi Tradition, Inlaid Hardwood Furnishings of the Late Ming and Qing Dynasties” in Liang Yi Collection, Small Objects(Hong Kong, 2007), pages 62–75.